Long-imprisoned American pastor Andrew Brunson is set to be released from Turkish prison this month, something the Trump administration has demanded for months. Ankara and Washington came to an agreement on the matter, according to senior administration officials, and Brunson’s charges will be dropped in a hearing tomorrow, NBC News reported. In exchange, the United States will change its economic policy towards Turkey. 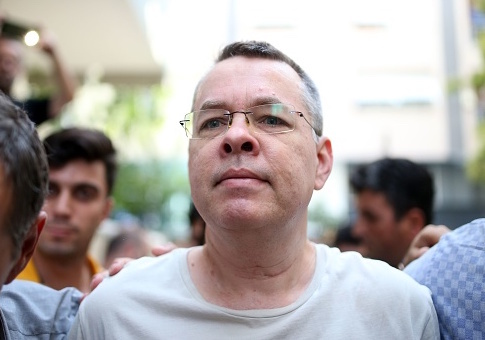 President Donald Trump had imposed sanctions on Turkey in response to its failure to release Brunson. Brunson is an American citizen from North Carolina. He spent decades as a pastor at the Resurrection Church in Izmir, Turkey. In 2016, he spent time in a Turkish prison and then was put under house arrest following accusations of aiding terrorist groups. Brunson and American officials strongly deny the allegation. American elected officials have for years sought his release. Last February, 78 senators and congressmen sent a letter to Turkish President Recep Tayyip Erdogan seeking Brunson’s release. In April, 66 senators did so again, "demanding the immediate release of wrongfully imprisoned American Pastor Andrew Brunson" by the "supposed NATO ally." Trump spoke out in Brunson’s defense on several occasions, calling his imprisonment a "total disgrace." Some doubt whether Erdogan will follow through on his promise. One administration official told NBC that a similar agreement was nearly reached months ago but fell through. Secretary of State Mike Pompeo yesterday reaffirmed his support for Brunson’s release at the Jewish Institute for National Security of America’s awards dinner last night. "I am very hopeful that before too long Pastor Brunson will, he and his wife will be able to return to the United States," he said. He called Brunson’s release the "humanitarian thing for Turkey to do." Brunson’s release could herald a shift in American relations in the region. Whereas Trump had publicly criticized Erdogan, he had expressed favorable views towards the Saudi monarchy, including making Saudi Arabia the site of his first foreign trip as president. Turkey is a NATO ally, and Saudi Arabia has a $10 billion arms deal with the United States. However, recent events have thrown that arrangement in question. Trump confirmed that American officials are investigating the "terrible thing" that may have happened to Washington Post contributor and Saudi critic Jamal Kashoggi. Kashoggi disappeared after entering a Saudi consulate in Turkey. Turkish sources claim he was murdered in the consulate. American intelligence reports that Saudi officials had discussed how to lure Kashoggi back to Saudi Arabia. Update 4:15 P.M.: A previous version of this piece used an incorrect name to identifiy Andrew Brunson. This has been correctly. This entry was posted in National Security and tagged Recep Tayyip Erdogan, Turkey. Bookmark the permalink.